The following appeared in the Moorhead Daily News: George Weiler of Indianola, Iowa, former resident of Fargo and well known in northwest music circles, was a visitor in Moorhead today. George Walter Weiler was born on 20 June 1884 in Tioga, Hancock County, Illinois. Johann Ludwig Weiler and Ellen Callahan appeared in the US federal census of 1 June 1900 in Corsicana, Navarro County, Texas, at 417 West 9th Avenue. Other members of the household included George Walter Weiler, Herold James Weiler, Lewis Forest Weiler, Esther Lambert and David Perry Penick. Also, boarding in the household were two young oil company workers. The following appeared on 13 July 1904 in the Corsicana Daily Courier-Light: Mr. George W. Weiler arrived home this morning from Chicago. Tenor Lloyd G. Kerr, graduate of New England Conservatory of Music, Boston, and pianist George W. Weiler, graduate of American Conservatory of Music, Chicago, appeared in an informal joint recital at Carnetie Hall on the evening of 19 August 1909. According to a published history of the Episcopal Church in Corsicana: "The little hand billow pipe organ, which Vivian Mowlam and others said they pumped as a boy, was put against the North wall in the little Church. I have been told by good authority the following: That this little organ was shipped from England to Philadelphia and used, then later installed in St. Matthews Cathedral in Dallas and, when they built a new church, it was sent here to St. Johns, and the following played on it: Mrs. Allyn was the first, then Mrs. Julia Mirus played it longer than any ... she did not obtain any material benefits for her long period of service, but when she resigned, the Vestry presented her with pearl handle opera glasses for "her long continuous and faithful services." For a short time Miss Emma Simkins played for $10 per month, and about 1910, George Weiler played for the Church Services. Miss Simkins became a well known portrait painter, and Weiler became a well known concert pianist. He married Elizabeth Rebecca McCoy, daughter of William H. McCoy and Ella F. McClintock, on 19 March 1910 in Fairbury, Jefferson County, Nebraska. The following appeared on 14 April 1912 in the Fort Worth Star-Telegram:: The open meeting of the Euterpean Club, held at the Westbrook Thursday afternoon, was a success musically as well as socially. Four hundred handsomely gowned women were assembled to hear the program rendered by five artists. It was matter of gratification to the members to have with them so sympathetic and responsive an audience. The two-part piano numbers by Mr. and Mrs. Weiler were given with splendid interpretation. The violin numbers and the subsequent encore by Mr. Whitlock were most enthusiastically received. . . . Mr. George Walter Weiler, piano. Mrs. Elizabeth Weiler, piano. Mr. E. Clyde Whitlock, violin. . . . The following appeared on 24 May 1912 in the Cleburne Morning Review:: Mr. George Weiler, who appears here Monday night at Carnegie Library, will be remembered by many who heard him several years ago when he appeared with Mr. Lloyd Kerr, tenor, in joint recital for the benefit of the Music Club. Mr. Weiler is a graduate of the American Conservatory of Chicago and also studied in Berlin with Rudolph Ganz. Mrs. Elizabeth McCoy Weiler who appears with her husband is also a graduate of the American Conservatory and in Berlin was under Madam Lehvinne, the wife of the distinguished pianist, Josef Lehvinne. These pianists are winning quite a reputation for their perfect ensemble. There have been many beautiful works written for two pianos; but the interpretation of these is rather unusual in this part of the country. The following appeared on 28 May 1912 in the Cleburne Morning Review:: The double piano work is quite new in the sout and this is the first performance of this character in Cleburne. Mr. and Mrs. Weiler are both very capable pianists; they have had very splendid advantages in America and abroad and have made good use of their opportunities. What would seem real work from others is a delightful pastime with them, so thoroughly do they understand and feel with each other their work seems to come from only one performer. Their ensemble has been characterized as perfect and those who heard them last night will give their assent to the statement. Mrs. Weiler gave a thoroughly enjoyable rendering of Chopin's Ballade in A flat. It has been said by critics of repute that only an artist can play Chopin. Mrs. Weiler gave a skillful interpretation. She plays with much feeling--minus the matterisms. Her work was well received but she would not respond with an encore. Mr. Weiler has many admirers here as he had appeared on a former occasion under the auspices of the Music Club. He has a splendid technique and cleverly played from the greatest master of the piano. He was forced to respond with an encore and gave Chopin's Valse No. 9. The following appeared on 13 December 1912 in The Texas Mesquiter: George Walter Weiler of the Weiler Studios, Fort Worth, and E. Clyde Whitlock, assisted by the Weatherford Choral Club, will give a classic piano and violin recital at Weatherford the third week in December. A feature will be the piano and violin sonata, rendered by Messrs. Weiler and Whitlock, and composed by Sjorgren. All numbers on the programme will be modern compositions by living composers. The most artistic local musical event of the season will be the Children's Costume Recital by Elizabeth [Mc]Coy Weiler during the week previous to Christmas. Music of various foreign countries will be reproduced, and the children are to dress in a fashion becoming each country and locality and throughout the entertainment each country's musical individuality and tradition will be observed. Mrs. Weiler is deovting much study to the plan and hopes to please those who like color and novelty in music. Bryan school is to have the honor of the entertainment. The following appeared on 15 January 1913 in The Panola Watchman, under "Fort Worth Art Directory": Concerts. Musicales. George Walter Weiler, Pianist. Elizabeth McCoy Weiler, Pianist. Two-Piano Recitals a Special Feature. Pupils Accepted. For Information and terms, address, Weiler Studios, Fort Worth, Texas. The advertisement also appeared on 13 February, 12 March, and 9 April. The following appeared on 18 May 1913 in the Fort Worth Star-Telegram: George Walter Weiler, pianist and E. Clyde Whitlock, violinist, will be heard in public recital Monday night in the auditorium of the Bryant School for Boys (formerly the Fort Worth University). The program numbers have been entirely from the composition of modern composers, and are arranged in interesting order. Among the novelties that have not been heard in Fort Worth are the d'Albert "Scherzo," for piano, which Mr. Weiler will play, and "Tallahassee," by Cyril Scott, which willl be given by Mr. Whitlock. This recital will be the last opportunity that admirers of Mr. Weiler will have to hear him in public recital. With Mrs. Weiler he leaves next month for a year's stay in Europe. Both Mr. and Mrs. Weiler will study while abroad with the famous pianist, Lhevinne. . . . He applied for a passport on 3 July 1913 while living in Navarro County, Texas. specifying residence Fort Worth, occupation piano teacher, and requesting that the passport be sent c/o W. H. McCoy, Fairbury, Nebraska. Passport was issued on 7 July. At age 29, George Weiler was described as 6'1/2" tall with brown hair and eyes, fair complexion, long oval face, high forehead, aquiline nose, large mouth and medium chin. George and Elizabeth Weiler arrived on 23 July 1914 in the port of Galveston on board the SS Neckar, having departed Bremen, Germany, on the 2nd. The following appeared on 27 August 1914 in the Grand Forks Herald:: Dean and Mrs. A. J. Stephens returned from a trip to Chicago where Dean Stephens and President Hansel of Fargo College were in conference with a number of men for the position of head of the piano department. George W. Weiler has been engaged for the position and will arrive in Fargo next week to get settled before the opening of the fall term. Mr. Weiler is a graduate of the American conservatory in Chicago, taking highest honors, also taking the honors in the completion of his post-graduate course. He was a member of the faculty of the American conservatory for four years, and has spent two seasons in Berlin and Switzerland studying with Rudolph Ganz. The following appeared on 5 September 1915 in the Fort Worth Star-Telegram: (Under "Opening of Fort Worth Musical Studios") Miss Clara Strong, Teacher of Piano, Pupil of George W. Weiler and Josef Rosenfield. Studio, 1728 Lipscomb, Opens Sept. 1. Telephone Rosedale 1201. The following appeared on 29 September 1915 in the Grand Forks Herald:: Program Out for Meeting of Educators. Two Thousand Expected Here for Convention Next Month. Address Will be Made by Prominent Outside Speakers. . . . Musical Education--. . . George W. Weiler, Fargo. . . The following appeared on 4 December 1915 in The Corsicana Daily Sun: Proud grandparents are Mr. and Mrs. J. L. Weiler, who have just received news of the advent of a new baby boy in the home of their son, George, who lives in Fargo, North Dakota. Should the young heir inherit his father's musical genius there will be added a prominent musician to the music world. The following appeared on 13 August 1918 in The Corsicana Semi-Weekly Light: (From Saturday's Daily) Mrs. Nellie Callahan Weiler, wife of J. L. Weiler, passed away at the family home, corner of North Eleventh street and West Fourth Avenue, at three o'clock this morning after many months of bad health. The deceased was fifty-four years of age, and had lived in Corsicana for nearly twenty hears. She was born in Johnstown, Pa., but grew to womanhood in Illinois, from where she came to Texas with her husband and three sons. The deceased was an active and faithful member of the First Methodist church, and lead a Christian life, the influence of which will live after her. She is survived by her venerable and invalid mother Mrs. Ester Penick, who made her home with the Weiler family, her husband and three sons, Prof. Geo. Weiler, of Fargo, North Dakota; Capt. Harold J. Weiler now with the American army in France, and Lieutenant Forrest Weiler, of Camp Logan, Houston. The latter is here and Prof. Weiler may reach here in time for the funeral which will probably take place from the First Methodist Church at 4 o'clock Monday afternoon, with interment in Oakwood. The active pall bearers will be S. W. Burdine, J. E. Blair, C. T. Banister, A A. Allison, W. J. Seelig and J. N. Royall. Honorary pall bearers will be the members of the United Commercial Travelers living in Corsicana. George Walter Weiler registered for the draft on 12 September 1918 in Fargo, Cass County, North Dakota, while living in Fargo with wife Elzabeth at 11 Blenheim, employed there as a teacher at Fargo College. George and Elizabeth Weiler appeared in the 1919 "Musical Blue Book of America" under the Fargo, North Dakota, Music Club listing: Mrs. Elizabeth Weiler, Chairman of Program Committee, and George W. Weiler (pianist, teacher of piano, organ and musical history, Fargo College Conservatory of Music) and Mrs. Elizabeth Weiler (pianist, teacher of piano and normal training, Fargo College Conservatory of Music). George Walter Weiler and Elizabeth Rebecca McCoy appeared in the US federal census of 1 January 1920 in Fargo, Cass County, North Dakota, at 2nd Avenue. Other members of the household included George Walter Weiler Jr. He was a teacher at the music conservatory, according to the 1920 census. The following appeared on 24 February 1920 in the Grand Forks Herald: The University Music Department has made arrangements to exchange music talent with the Fargo Conservatory of Music. The University is fortunate in receiving as the first exchange soloist Mr. George Walter Weiler, head of the piano department of the Fargo College Conservatory, who will appear as soloist with the Philharmonic Orchestra next Sunday. Mr. Weiler entered the American Conservatory of Music in Chicago in 1901. In the short space of four years, after having taken every honor the school could bestow upon a pupil, he became a member of the faculty of that insititution. After four years' teaching at the American Conservatory and continuiong his studies under Chicago's leading piano teachers, he went to Berlin, Germany, and spent the year 1910 in further study with Rudolph Ganz. He then returned to the United States, but after three years of successful college he again made an extended visit to Europe, resuming his studies in piano with Mr. Ganz during the season of 1913-14. Since his return to America at the outbreak of the war in Europe, he has been at the head of the piano department of the Fargo College Conservatory. Mr. Weiler has appeared extensively throughout the country in piano recital work and with concert companies. He has been very well received wherever he has played, and the newspapers have been particularly cordial in the way they have written of his concerts. The following appeared on 29 February 1920 in the Grand Forks Herald: The University Philharmonic orchestra will give a program this afternoon at 3 o'clock in the Metropolitan theater. The orchestra has been rehearsing faithfully on the numbers which are to be presented, and the program is one of the most pretentious that the organization every has attempted. George W. Weiler, head of the piano department of the Fargo conservatory of music, is to be the soloist, and will give two numbers. Mr. Weiler is known as a musician of skill, and his appearance this afternoon undoubtedly will prove a drawing card. . . . It is worthy of note that in the 1920s Phoebe Kammerer Frank was living in Devil's Lake, Ramsey County, North Dakota, wheat farming country. She told her grandchildren that Indians used to peek in the windows while she was playing the piano. Phoebe's brother Adam was married to George Weiler's father's first cousin, Ursula "Lucy" Weiler, daughter of Balthasar Weiler. The following appeared on 23 September 1924 in The Corsicana Daily Sun: At 7:30 this morning, J. L. Weiler died suddenly in the bath room at his home, 2111 West Fifth avenue. The deceased was 63 years of age in May last and had been a resident here for twenty-four years. The deceased was a native of Illinois and came from that state to Texas. For a number of years he engaged in the furniture business, but due to ill health he had not been regularly in business for some time. The deceased was a member of the First Methodist church, and was one of the most devoted and ardent workers in the Sunday school. He organized a men's Bible class in the First Methodist church, and when it became necessary for him to cease teaching the class, in his honor it was named the Weiler Bible class, and still bears his name. The class is now one of the largest Bible classes ever in a Corsicana Sunday school, and will continue to bear the name of the man who organized and who devoted many anxious hours in the labor of building and keeping the class foremost in the good work of the Sabbath school. The deceased was a good and true man in all the essentials of life, and his death, though not unexpected, is sorely regretted by the enrire community. Surviving the deceased is his wife and three children. The children are George Weiler of Iowa, Harold Weiler of Wichita Falls, and Forrest Weiler of Dallas. Two step-daughters live in Nebraska and Minnesota, and a step-son in Montana. Funeral arrangements will not be announced until these are all heard from. 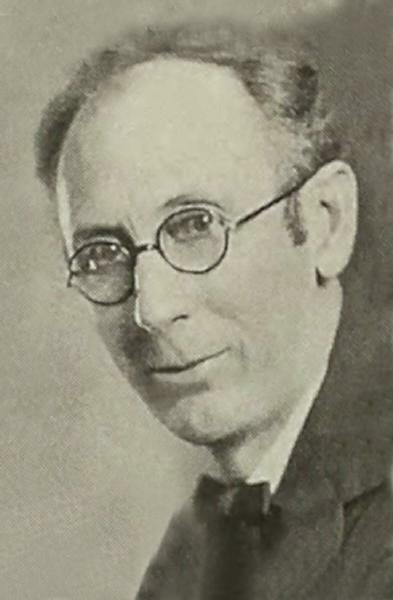 The following appeared in the 1928 Simpson College yearbook Zenith: (Conservatory of Music) George W. Weiler, Professor in Pianoforte; Musical History, Analysis. B.M., American Conservatory, Chicago; Post-Graduate highest honors American Conservatory; Taught in American Conservatory two years; Two years Professor of Piano and Theory, Polytechnic College, Fort Worth, Texas; Studied under Rudolph Ganz in Berlin two years; Professor of Piano, Fargo Conservatory of Music, Fargo, N.D., 1914-1924. George Walter Weiler and Elizabeth Rebecca McCoy appeared in the US federal census of 1 April 1930 in Indianola, Warren County, Iowa, at 1001 North Howard Street. Other members of the household included George Walter Weiler Jr. He was employed as a music teacher, according to the 1930 census. The following appeared on 1 April 1937 in the Lenox Time Table: Arrangements have been made for the appearance of George W. Weiler of Indianola, well known concert pianist, in a recital at the United Presbyterian church Monday evening, April 5. The program will begin at 8 o'clock, and admission charges of 10c, 15c and 25c will be made. Mr. Weiler broadcases every Thursday at 4:15 over WOI at Ames. He plays classical music but he has such a delightfully informal way of presenting his program that his entertainment appeals to all classes. Mr. Weiler's experience has included training at the American Conservatory at Chicago, where he received three highest honors, and two seasons of study under Rudolph Ganz in Europe. He has had more than twenty years of successful teaching experience. George Walter Weiler and Elizabeth Rebecca McCoy appeared in the US federal census of 1 April 1940 in Indianola, Warren County, Iowa, at 1011 North Howard. Other members of the household included George Walter Weiler Jr. All three were living in the same house in 1935. The following appeared on 27 May 1942 in the Lenox Time Table: Music . . . Prof. George Weiler is located at Charles City, Ia. He is connected with a Minnesota piano firm. He demonstrates and sells pianos. Prof. Weiler is still a fine artist at the piano himself. He should be able to help people feel the value of having a piano in every home where there is a talented boy or girl. At present, Lenox has only three grand pianos. It would be interesting to know how many upright pianos there are in town. Lenox seems to be known as a very musical town. George Walter Weiler became a widower at the 19 April 1947 death of his wife Elizabeth Rebecca McCoy. The SSDI lists Lake Park, Becker County, Minnesota, as the last residence of record of George Walter Weiler. George Walter Weiler died in March 1973 at age 88.